Eating garlic is good for your heart. Research shows that this bulb affects arteriosclerosis, triglycerides, blood pressure, platelet aggregation, and plasma viscosity – all of which are risk factors for heart disease. Researchers at Penn State University reported that garlic can reduce the risk of heart problems by 38 percent. In a four-year German study, researchers concluded that garlic can reduce the risk of heart attack and stroke by more than 50 percent. Another benefit of garlic for the heart is it can help prevent atherosclerosis. Evidence shows that garlic has the ability to prevent the formation of arteriosclerotic plaque, which makes arteries become thick and stiff. Researchers at the University of California, Los Angeles (UCLA) carried out a study on 65 people and their risk for heart disease. In the study, they gave the participants a placebo capsule or a capsule containing 250 milligrams (mg) aged garlic extract and 100 micrograms (mcg) vitamin B12, 300 mcg folic acid, 12.5 mg vitamin B6, and 100 mg L-arginine. They measured the amount of calcification in the coronary artery before and after the study, and after a year, those who took garlic and other supplements experienced significant reductions in the progression of coronary artery calcification. Moreover, the aforementioned four-year German study revealed that consumption of garlic powder every day reduced the volume of arteriosclerotic plaque by as much as 18 percent. In a study published in the International Journal Cardiology, aged garlic extract was observed to increase brown fat around the heart muscle, while reducing white fat. Brown fat is a more active form of fat tissue, and produces heat or energy, while white fat is inactive and is for storage. White fat can increase the risk of calcification in the heart, while having more brown fat around the heart muscle reduces the risk of calcification. Researchers at UCLA also studied the effect of aged garlic extract in individuals on statin drugs. After taking 4 milliliters (mL) of aged garlic extract for a year, the participants’ rate of coronary calcification was three times slower than those who took a placebo. These findings suggest that garlic may be beneficial to people who are at high risk of future cardiovascular problems. 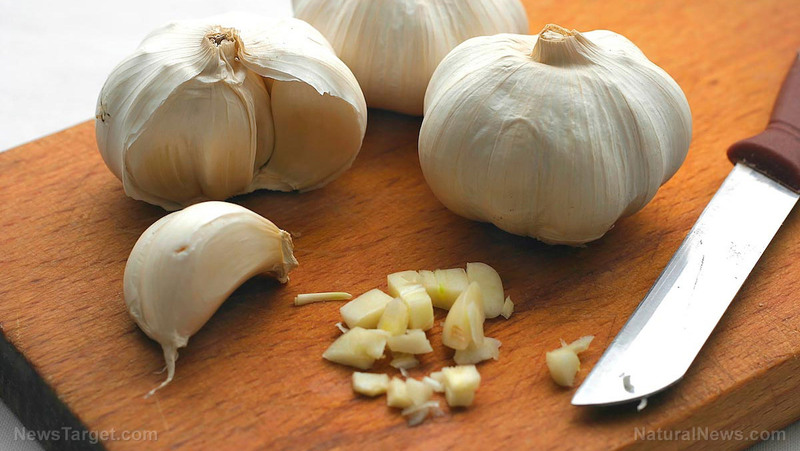 Garlic is an even better and safer option for lowering blood pressure than the drug atenolol. In a study published in the Pakistan Journal of Pharmaceutical Sciences, it has been shown that daily consumption of garlic at doses ranging from 300 to 1,500 mg greatly reduced systolic and diastolic blood pressure in individuals with hypertension compared to atenolol and placebo. This effect can be attributed to its sulfur compounds that are converted into hydrogen sulfide, which dilates blood vessels, improves blood flow, and lowers blood pressure. Garlic also prevents the common cold because it contains allicin, the compound that gives its smell. An Australian study has revealed that garlic consumption reduces the incidence of colds by over 50 percent. Other studies have also reported that it can reduce the severity of cold symptoms. Garlic removes lead from the body better than the drug d-penicillamine, according to a study. It also improved lead’s side effects, such as irritability, headaches, deep tendon reflex, and systolic blood pressure, while the drug didn’t and even caused serious side effects. In addition to taking it in supplement form, you can reap garlic’s health benefits by using it in soups, sauces, dressings, and more. You can also eat it raw, just mix it with extra virgin olive oil and some salt.